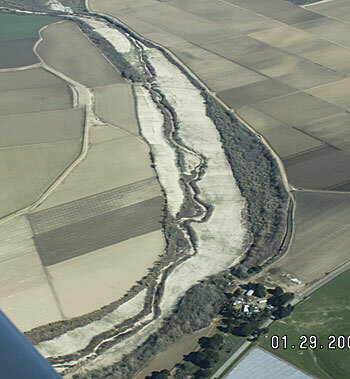 From the air one can clearly see areas along the Salinas River near Chular that have been cleared of all vegetation. A public hearing on March 17 could have a major impact on the quality of water on the Central Coast. Your attendance could make a difference in cleaning up our rivers and streams. In December, the California Water Resources Control Board released a study showing that Central Coast surface waters are the most toxic in the State. Local rivers, including the Pajaro River, the Salinas River, and their tributaries are listed as “impaired” under the Clean Water Act due to a variety of causes including agricultural runoff. Because surface water also recharges groundwater aquifers, polluted streams and rivers degrade the major source of drinking water on the Central Coast. To help remedy the situation, the Central Coast Regional Water Quality Control Board released Draft Recommendations in February of 2010. The February draft was revised in November 2010. The newer version is considerably weakened. Sierra Club joins Monterey Coastkeeper, Surfrider Foundation, the Environmental Justice Coalition for Water, Food and Water Watch and other groups in supporting the original February 2010 recommendations. The February Recommendations protected all riparian areas adjacent to property where agricultural runoff occurs. The weakened November Recommendations address only riparian areas next to waters listed as impaired under the Clean Water Act. The revised recommendations do nothing to prevent impairment of currently healthy areas. Riparian areas offer many environmental benefits which keep creeks and rivers clean. A 50-foot vegetated strip along a creek filters runoff and helps keep pesticides and nitrates from polluting waterways. Additionally vegetated buffers provide habitat to wildlife including endangered Red-Legged frogs and Long-Toed salamanders. The absence of vegetated buffers on creeks and rivers has an impact not only on these waterways, but also on estuaries such as Elkhorn Slough and on the Monterey Bay. When agricultural pollutants flush down the waterways to the sloughs and the Bay, they can trigger toxic algae blooms that poison sea otters, sea lions, and birds. The February Recommendations require that property owners comply with water quality standards where the water leaves the farm. The November version shifts the point of compliance from the farm to the “receiving waters.” The Sierra Club believes that water quality should be monitored both at the farm and at the receiving waters. Knowing sources of pollution enables several farms to partner with each other and perhaps with the County on one pollution control project at lowered cost to each partner. Joint projects would likely be easier to monitor and regulate. The weakened draft of the regulations continues much of the voluntary compliance which has not worked in the past. Additionally it delays addressing major sources of nitrate and pesticide pollution such as tile drains. Although the weakened draft regulations make some incremental changes for the better, they pale in contrast to the February 2010 draft which was vehemently attacked by the agricultural industry. Much more needs to be done. The agricultural industry lobbied hard to weaken the Recommendations citing the high cost of keeping our water clean; a comparable analysis was not conducted on the high cost to individuals and the general public of continuing to pollute our water. Nitrates in well water can sicken farmworkers living in small rural communities. Babies that drink such water can develop “blue baby syndrome,” and stop breathing. Research shows that long-term exposure to elevated nitrate levels in drinking water, even levels that are not immediately toxic, can have a wide range of serious health consequences. Although local governments have failed to account for or analyze the public and private costs of contaminated water, some of the struggles endured by individual communities suggest the costs regionally may be huge. For example, for years the Monterey County farm worker community of San Jerardo suffered with a contaminated water source. The community banded together and obtained public grants totaling about $5 million to build a new water system. Ongoing operation of the new system costs each San Jerardo household about $113 per month. These costs do not include the costs for treatment of illnesses and chronic disorders suffered prior to the new water system. Nor do they include the impacts of lost wages during that time. Can we afford to clean up our water or can we afford not to? Will watered down rules be adopted or will we take clean water seriously? •	Come to the March 17 meeting of the Central Coast Regional Water Quality Control Board in the Watsonville City Council Chambers. Even if you don’t feel you know enough to speak, your presence will be very important. Volunteers will be there to pass out identifying tags so the board knows you are there to support clean water. •	Call one of the Sierra Club activists below for more information regarding time of the meeting and other details. The meeting is during the day. At press time the agenda had not yet been posted so the exact time this issue will be considered is not yet known. Santa Cruz County:	Deirdre Des Jardins, , 423-6857. Monterey County:	Julie Engell, , 920-2734. Steve Shimek, Julie Engell, Deirdre Des Jardins, and Debbie Bulger contributed to this article.